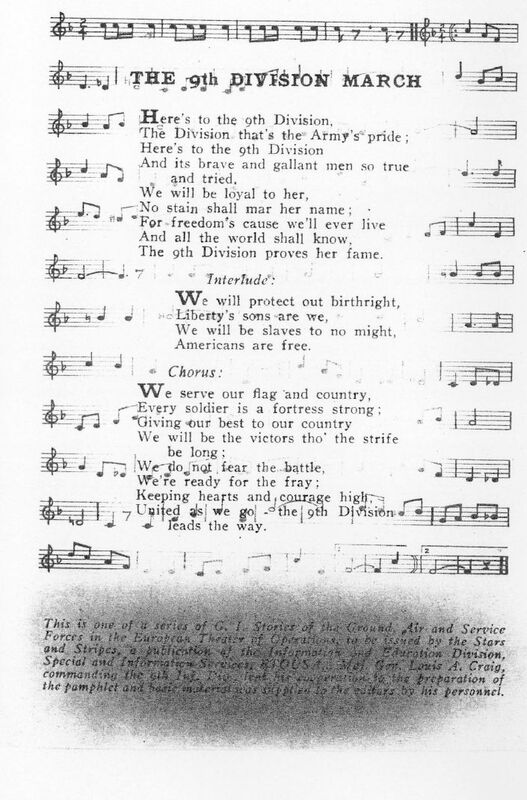 The words of the 9th Division March were composed by Mrs. Solly Powell Singley. Mrs. Singley dedicated it to her brother, Lt. Col. Grayson C. Powell, who was a Judge-Advocate of the 9th Division. The 9th Infantry Division also had its own band, simply named “The 9th Infantry Division Band”. Unfortunately, little is known about this band. The musicians played the well known marching music, played various tunes from the classic jazz artists, but also knew how to inspire the 9th Division men by playing the “9th Division March”. Music always has been a positive influence on people. Can you imagine some of the 9th Division men singing the words out loud? 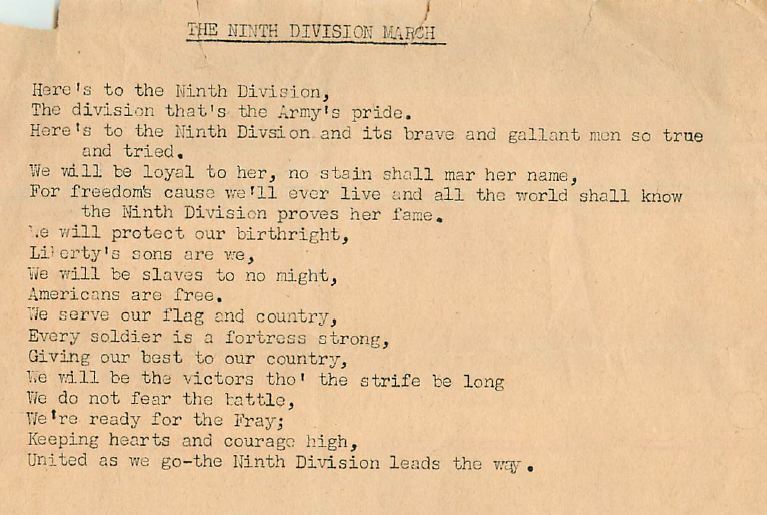 Ninth Infantry Division March text from Sgt. Wallace E. Burr, 60th Infantry Regiment. 9th Division March original music sheet. 9th Infantry Division Artillery band playing in Les Pieux, France, on July 4th, 1944. Picture by Frank Lovell, 60th Field Artillery Battalion, 9th Infantry Division. After seeing the music sheet here, Daniel Fonner, the grandson of Pvt. Frederick Allen Fonner , arranged the notes a bit and recorded his own version. It might be pretty close to what the original march must have sounded! Listen to the video below. Thank you Daniel! Any more information about the March (maybe an official, original recording?) or the Ninth Division Band would be appreciated!